Life has not stood still over the past few years, and so there will also be plenty of surprises along the way as players are forced to recognise that many of their core assumptions are either untrue or out of date. The excitement of the 2009–2014 stimulus period, for example, seems to have led many investors to ignore the 2012 warning from then Saudi oil minister Ali al-Naimi that “Oil demand will peak way ahead of supply”. Today, they are being forced to play catch-up, as they digest the implications of Saudi Arabia’s new National Transformation Plan. Yet its core objective that “Within 20 years, we will be an economy that doesn’t depend mainly on oil”, is clearly linked to Naimi’s earlier insight. China’s slowdown confirms the depth of the challenge to conventional thinking about future auto and oil demand. Many still assume that EMs will account for two thirds of global auto sales by 2020, and underpin future oil demand growth. But the China-induced collapse of commodity export revenues in formerly high-flying economies such as Brazil and Russia means that this rosy scenario is also in need of major revision. 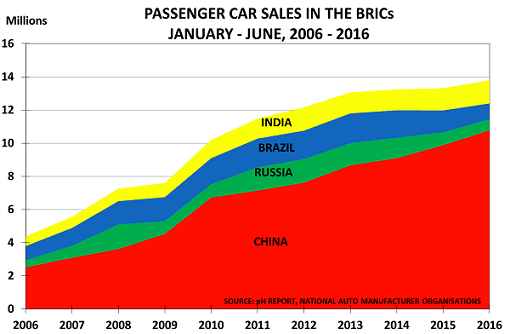 As noted last November, Brazil was temporarily the world’s fourth largest auto market in 2013, whilst Russia was forecast to reach fifth position by 2020. But as the chart of H1 sales in the BRIC countries shows, volumes in both countries have almost halved since then. China’s own sales growth is also slowing, as the government’s need to combat pollution has led it to focus on implementing policies aimed at boosting the role of car sharing and public transport – while its focus on electric vehicles is a further downside for future oil demand. As we move into H2, it therefore appears that the fundamental assumptions behind the $3tn of energy market debt – $100/bbl oil and double-digit economic growth in China – are looking increasingly implausible. 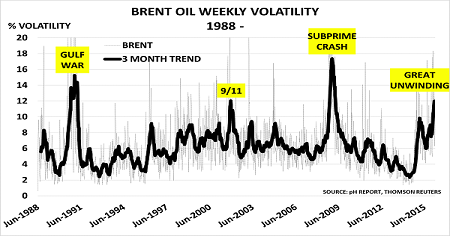 And given oil’s pivotal role in the global economy, today’s near-record levels of oil market volatility may also be trying to warn us that wider problems lie ahead for financial and energy markets. Of course, everyone insists that the Comptroller is wrong to be worried, just as they said the housing market was in great shape – until it collapsed. But warning signs are everywhere, if one wants to look. Delinquency rates on subprime loans packaged over the past 5 years are already over 5% – and that is with an improving jobs market. The problem is that loans are being made to people with very low credit scores, or even no credit scores. And they are being asked to pay interest rates of around 20%. This is clearly unsustainable, and highlights how the auto industry is gradually running out of potential new customers – just as happened with housing. At the same time, manufacturer inventories are rising, up to around 90 days for Ford and Fiat Chrysler, whilst overall incentives have risen to 10.6% of revenue. Ford’s car inventory is 38% above its normal level at this time of year, despite it having boosted lower-margin rental car deliveries (adding 7% to its total volume). As Credit Suisse note, auto makers will soon have to cut production, as their current sales strategies are running out of road. They expect a 6% cutback from Q2, meaning that 2016 production would be flat versus 2015. But this may well prove too optimistic. “The auto industry expanded the use of leasing in the mid-1990s, helping to fuel retail sales of new vehicles. Eventually, a glut of off-lease cars sent resale values down and auto lenders who had bet residuals would remain high ended up racking up billions of dollars in losses, having to sell the cars for much less than they anticipated. Of course, all those making short-term bonuses from selling the loans and leases, or repackaging them for sale to investors, naturally claim that everything is fine. But the rest of us know what to expect. Past experience is normally a good guide to the future outlook. It seems unlikely that seasonal patterns have suddenly changed quite so much, especially as March has always been a strong month. Estimates for UK self-registration suggest it now accounts for at least 11% of total UK sales, and higher percentages in other key markets such as Germany. And this is despite average discounts in Germany now reaching 20%. “It’s the last thing you should do because you buy this asset, it depreciates fairly rapidly, you use it 3 per cent of the time, and you pay a vast amount of money to park it for the other 97 per cent of the time”. Auto manufacturers, unlike car dealers, have alternatives when it comes to confronting the challenge of car-sharing. Smart ones will realise that increasing numbers of people are no longer interested in owning cars. And so instead, they will focus on developing new income streams based on the megatrend of mobility. It also depends on how many questions you ask. The headline numbers are clearly good. And they are not being achieved by major discounting, which was the position last year. Then, average incentives had hit $2633 in February, and headed higher into the peak spring selling season. But look a little deeper, and problems quickly emerge. Prices in the used car market have begun to fall, with those for some “near-new” compact vehicles down 2.8%, and midsize values also weakening. The reason is better availability, as buyers trade-in used cars for new leases. The US Federal Reserve’s cheap credit policy has meant that 4 out of 5 auto sales are now bought with credit or leased. Effectively, therefore, it is helping to grow the “sharing economy”, where drivers no longer feel the need to actually own the vehicle they drive. This has good and bad results. In the short-term, it means automakers can increase prices and margins, and still make sales as the cost is spread over a longer period. But in the medium-term, it means they must expect to see lower sales in future years. The reason is simply that lease terms have been rising to unheard-of levels. Volkswagen highlights the pressure they are under. With an ageing fleet line-up, it is now forced to offer its Jetta model on a lease costing just $39/month in San Jose California, or between $89 – $99/month more generally. You could end up paying more per month for some mobile phone packages. And, of course, there is always car-sharing itself. Ford have now followed BMW and Mercedes in entering the market with its new Go!Drive brand. And each shared car takes 17 privately owned vehicles off the road, according to industry estimates. Of course, many people will still want to drive their pick-up trucks and SUVs. But there are clearly an increasing number of people who are looking for new ways of meeting their need for mobility. As a result, it seems likely that the US auto market will look quite different in 5 and 10 years time. Major problems are developing in the US auto market. The critical issue is that companies have been adding capacity since 2009 on the basis that demand would return to SuperCycle levels. But it hasn’t. The reason is that companies have already pushed the boundaries as far as possible. Loans to ‘deep subprime buyers’ (those with credit scores below 550), have been the main driver for recent sales growth, along with the increase in lending term. Deep subprime loans jumped 13% in Q2, up 770k, compared to 5% overall loan growth. The detail of the incentive programmes highlights the intensely competitive state of the market. Honda have increased their incentives by 41% since September 2013, Nissan by 26%, Toyota by 23%, Fiat-Chrysler by 16%. Only Hyundai has actually reduced spending. Of course these strategies are self-defeating. By tying buyers in for 6 years, the companies essentially miss the chance to sell them a new car before then, as the existing loan is still being paid off. Even worse, however, is the growing reliance on subprime loans. The New York Times reports shows these were 27% of all auto loans in 2013, with interest rates often at 23% or more. And total subprime lending in Q1 reached $145bn. Of course, the automakers know that these borrowers are highly likely to default. So they are increasingly forcing these buyers to install ‘starter-interrupt devices’. These are now installed in around a quarter of cars bought with subprime loans. They allow lenders to disable the car remotely, leaving the driver unable to operate their car. As one would expect, these are increasingly leading to horror stories of car engines being turned off when payment is late by a day or two. And even worse, the NYT reports claims that engines have been turned off whilst cars are being driven on the freeway. None of this sounds like an industry which is likely to see robust growth for the next few years. A year later, we are clearly much nearer the end of this second subprime boom. As we learnt in 2008, companies cannot create a sustainable business model by lending at sky-high rates to people who cannot afford to repay the loan. In the major markets, Spain’s renewed incentive programme has pushed 2014 volumes up 16% to date. The UK’s bank compensation payments means its volumes are up 10%. But without these gains, and a strong performance in Poland, total EU volumes would have shown only half the current increase. The other 3 major markets remained weak with Italy up just 3.5%, and France only 1.6%. Germany, Europe’s largest market, saw sales actually fall 0.4% in August. And, of course, major discounts continue to be needed to drive even these volumes – German discounts now average 20% and French discounts average 18%. Storm clouds are also rising over the important Russian market. It has become a critical market for EU manufacturers, with industry experts expecting its volume to overtake Germany by 2016. But instead, official data shows sales down 26% in August. The decline is also accelerating, after sales fell 17% in June and 23% in July. Ford are also reversing course. They had been aggressively expanding their Russian JV, but then announced in July that they were writing down their entire $329m investment in the company. Developments in W Europe and Russia are just another example of the way that the world is moving into a New Normal of increased volatility and lower demand growth. Suppliers and investors who believed industry forecasts of steady growth are now having to reverse course, just like GM and Ford. And the situation may well get worse, not better, if Russia implements its threat to ban Western car imports. They also confirm it is foolhardy to develop straight-line forecasts for future demand. One leading analyst had forecast Russian auto volumes would increase a steady 6%/year, with 2020 volume reaching 4.4 million. Instead, on current trends, they could be half this level by the end of 2014, and still in decline. As the blog will discuss tomorrow, the New Normal requires companies to challenge internal groupthink. The example of GM and Ford in Russia highlights the growing danger of instead indulging in wishful thinking about future demand levels.